ARLINGTON, Va. – Washington Capitals center Matt Hendricks, goaltender Michal Neuvirth, assistant coach Dean Evason and Slapshot visited Glassmanor Elementary School in Oxon Hill, Md., on Thursday, Sept. 8 to host the Capitals Hockey School. The trio began the session fielding questions from students in the school’s recreation center before directing a floor hockey clinic with more than 100 third- through sixth-grade students. Led by Evason, Hendricks and Neuvirth instructed the students on puck-handling, passing and shooting before hosting a skills competition. Two students volunteered to be dressed as goaltenders and received some personal advice from Neuvirth, who showed them how to put on the pads and how to handle the goalie stick. Following the competition, the students scrimmaged with the pair of players and Slapshot. The staff also had a chance to participate, beating the students in a friendly scrimmage. The hour-long program concluded with the Capitals donating a set of hockey equipment to the elementary school. “The kids had great energy today and really got into it once we showed them how to hold the stick,” said Hendricks. “They asked some really good questions today too,” said Neuvirth. All students who participated in the session received autographed player cards from Hendricks and Neuvirth, Caps squishy pucks and Hockey 101 booklets. The school also received an official Capitals Hockey School banner to display in their school year-round. This was the first Capitals Hockey School visit this season. 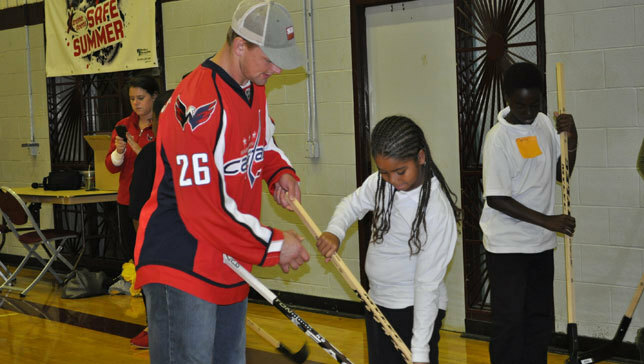 The Capitals host two Hockey School visits each month between September and May and donate street hockey equipment to each participating school. This is the fifth consecutive year the Capitals have conducted their Hockey School program. The Caps have hosted more than 50 clinics and reached more than 7,500 students in the past four years. Hockey School is a free program, designed to be both instructional and interactive, with the goal of exposing students to floor hockey while teaching proper technique.